On Monday night, USC Thornton School of Music’s jazz students brought life to original compositions during “Jazz Night” at the Carson Center. Held in a black box theater, the “Jazz Honors Combo” is a three-hour concert comprising three unique jazz combos, open to a public audience. Before the show began, the empty seats of the theater began to fill up with those excited to listen to music. Alex Knoll, the senior production coordinator for contemporary music at Thornton was involved in hosting the event and explained that “[the Thornton] jazz program acts within the larger contemporary program.” The evening’s concert reflected this, with the honors combo performing a blend of electronic music and traditional jazz. The event was formatted to showcase three jazz combos featuring everything from traditional swing jazz to experimental jazz. “The first two combos [consisted of] more traditional swing jazz, but the third combo [was] more experimental,” Reid said. In Reid’s terms, the third combo is more experimental because they are “the honors combo, which is a select group doing their own production of their own pieces.” The production aspect separates the honors combo from the first two because the other combos solely play music which they have written. 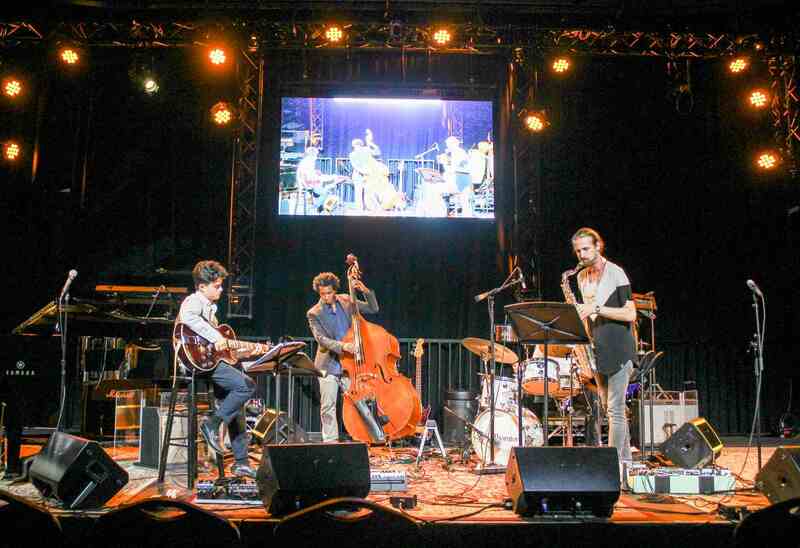 The honors combo, however, has spent the past two to three weeks working on the music software Logic Pro, honing in their technological production as well as their traditional jazz studies, according to Reid. As the first two combos played their sets, the difference between the them and the honors combo became apparent. The first combo, referred to as “Edwin Livingston’s First Combo,” were named after the bassist himself played the traditional style of jazz. Consisting of the five classic jazz instruments – piano, bass, saxophone, guitar, and drums – Livingston’s First Combo played five standard jazz pieces, each with their own personality. The honors combo, headlined by Jason Goldman, had a different sound altogether. While this combo continued with traditional instruments and a classic swing sound, there was a unique addition to the performance. The honors combo enhanced their self-written music with self-produced computer-generated music production, thus emphasizing the contemporary component of the jazz night. Because each piece of the night was written by a different performer, there was a sense of pride on the stage. Each player of each combo brought a new sound to the table. Whether it was a slow and thoughtful piece that emphasized the saxophone or a rapid, loud piano-heavy piece, “Jazz Night” helped to showcase the talent found at Thornton.